Common to all Flat Panel Displays (FPD), Solar Cells and Touch Panels technologies is the Transparent Conductive Oxide (TCO) thin films made of Indium Tin Oxide (ITO). The ITO serves as transparent circuit, interconnecting on the back plane ofcolumn and row drivers between transistors and pixels, or on the front panel in touchscreens, offering conductivity and light transmission. Conventionally, this complex pattern is generated using photolithography and is the most widely used technique applied by industry manufacturers. Through a series of masking, exposure and wet chemical etching processes, the ITO is patterned before continuing onto subsequent stages of the device fabrication. As an alternative to wet chemical etching, laser processing of TCO is the direct write of patterns in a single step process. Laser processing TCO involves the laser ablation of material, which subsequently reduces time and waste, whilst offering mass manufacturing in a cost effective and environmentally sustainable way. The Diode Pumped Solid State lasers employed by M-Solv can be accurately manipulated by a galvanometer scanner and focussing the laser beam onto a substrate. The focus of the laser beam can then be moved at high speed around on the surface of the substrate in order to direct write a pattern with micro machined features in the TCO. The key advantages of laser patterning over wet chemical photolithography are the low tooling costs, the ability to change batch run cost effectively and processing in a timely manner. TCOs are largely deposited onto glass and have more recently been used in applications which use plastic for thin film technologies such as Photovoltaic (PV), Organic display (OLED) and Smart glass. In recent years, however, transparent conductors (TCs) are not only limited to oxide-based materials. Emergent transparent conductors, such as silver nanowires, metal mesh and graphene have also developed due to the brittleness of the ITO (or TCOs in general) that fails to meet requirements and demands for flexible electronics and wearable electronics. 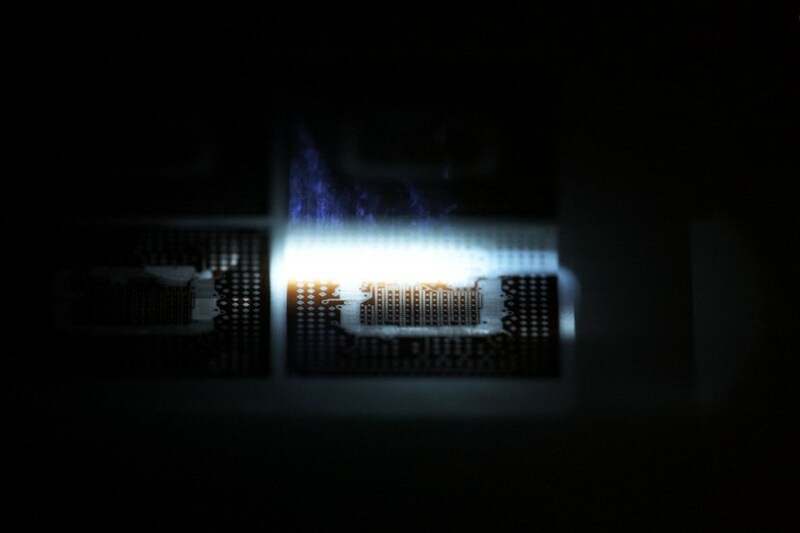 As well as laser patterning of ITO (or TCOs in general) on glass or plastic substrate, M-Solv is also developing laser patterning techniques for the novel TCs to meet the current demands from the industry.